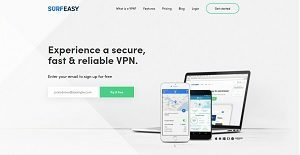 SurfEasy is a fast, no-log virtual private network (VPN) that encrypts web usage, transmissions, and more. The service’s VPN functionalities perform automated, guidelines-based internet traffic management through over 1000 servers across 28 countries to-date. While SurfEasy boasts of rapid speeds, security is not compromised as it assures that users’ originating IP addresses are not recorded when they are connected to the service. The technology also does not track what web applications were ran or websites that were accessed. Owned by the Canadian-based company behind the Opera browser, SurfEasy boasts of a Wi-Fi Security feature that can automatically shield users upon the detection of an unsecure wireless spot. This allows seamless internet connectivity and safeguards from possible internet attacks. Since SurfEasy does not require users to log on to their network, the service does not retain any logs related to a user’s online browsing or downloading activities. The software also utilizes bank-grade encryption technology to keep networks as protected as possible. These measures allow users to worry less about internet security so that they can prioritize more important tasks. SurfEasy has one-click IP masking that allows users to switch locations easily. Those behind the technology also developed dedicated and safe torrent servers so one can torrent without hiccups, complete with “auto-enable” protection. Furthermore, the network claims to maintain a 99.9% uptime guarantee. All these result to much faster and enjoyable online activities. The availability of SurfEasy servers in 28 countries and counting provides access to regional content that may be blocked. By hurdling georestrictions, users can stay on top of their online to-dos even if they are travelling abroad. SurfEasy utilizes advanced tracker blocking algorithm to shield tracking cookies. These are what advertisers use to follow potential customers online. When these are blocked, users can have a more private and peaceful online experience. A powerful application, SurfEasy can be used simultaneously by up to five devices. It is also supported by a variety of platforms. By allowing unlimited use on different devices, users can be more productive. If you are considering SurfEasy it could also be a good idea to investigate other subcategories of Best VPN Services collected in our database of B2B software reviews. Since each enterprise has specific business requirements, it is advisable for them to abstain from seeking a one-size-fits-all faultless software system. Needless to say, it would be useless to try to find such a system even among popular software applications. The intelligent thing to do would be to catalog the various important aspects that need consideration such as required features, finances, skill levels of workers, company size etc. Then, you should do your homework thoroughly. Read some SurfEasy reviews and look into each of the other apps in your shortlist in detail. Such exhaustive groundwork can make sure you reject ill-fitting applications and zero in on the system that presents all the elements you need for business success. We realize that when you make a decision to buy VPN Services it’s important not only to see how experts evaluate it in their reviews, but also to find out if the real people and companies that buy it are actually satisfied with the product. That’s why we’ve created our behavior-based Customer Satisfaction Algorithm™ that gathers customer reviews, comments and SurfEasy reviews across a wide range of social media sites. The data is then presented in an easy to digest form showing how many people had positive and negative experience with SurfEasy. With that information at hand you should be equipped to make an informed buying decision that you won’t regret. What are SurfEasy pricing details? What integrations are available for SurfEasy? If you need more information about SurfEasy or you simply have a question let us know what you need and we’ll forward your request directly to the vendor.